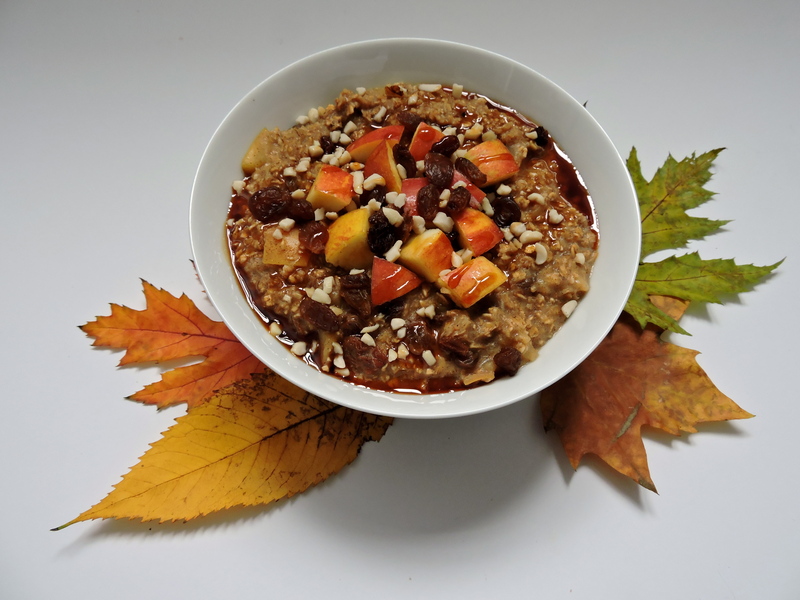 Delicious and Easy Autumnal Oatmeal Recipe. If you follow me on Instagram then you know I LOVE oats. It’s the perfect breakfast in my eyes, and when the weather gets colder, who doesn’t want a bowl of warm goodness in the morning?! Now, I have tried many different variations of oats (plain, fruity, chocolaty…) but I have to say, this recipe is one of my favourites; I swear it warms my heart a little with each spoonful. Plus, it has a lot of fruit it in, so you’re starting your day off in a super healthy way. 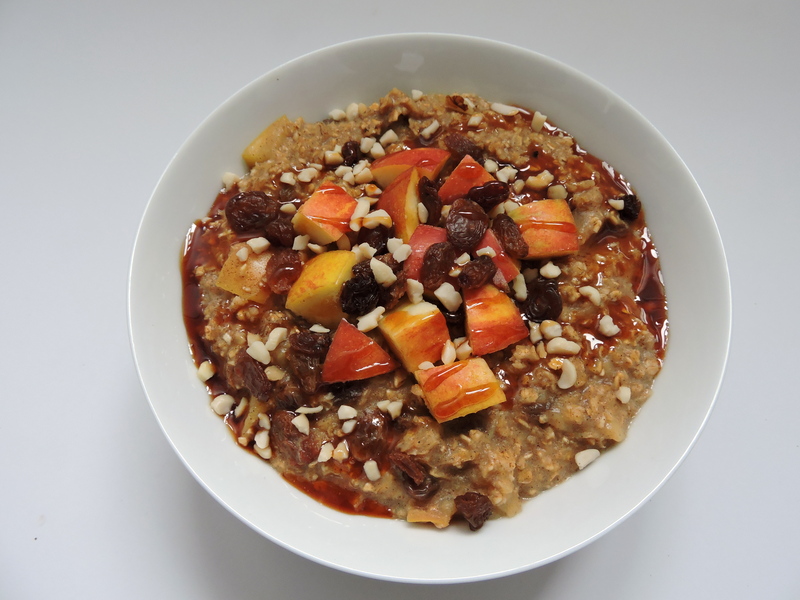 So here is my recipe for the ultimate autumnal oats, or as I like to call it, “Fall in a Bowl”. Seriously, try this stuff, you’ll thank me later (yes, I’m that confident in my oatmeal making skills). I should say that I like my oatmeal very firm; if you like yours more runny, just add more liquid! Play around with the ingredients to find your perfect consistency. In a small pan, add your water and plant-based milk and put on a low heat. After a few minutes add you sweetner, cinnamon, raisins and vanilla to the pan. Keep your eye on it; it should be starting to simmer. Check whether your apples have softened; if they have, it’s time to add your oats. It’s as simple as adding your dry oats to the liquid and stirring well. Leave on the heat for a few more minutes whilst stirring to make sure it’s warm all the way through. And that’s it! Serve with your remaining apple, some raisins, sweetner and some chopped nuts for the perfect breakfast. I realise that this is a fairly easy recipe, but I couldn’t resist sharing it. I hope you enjoy, and if you try it, please let me know. Also, comment below what your favourite type of oatmeal is! It’s currently 80 degrees where I live but as soon as it cools off, I’m making this. I usually prefer to start my day with a smoothie so if I eat oatmeal, it’s for a quick and comforting dinner. I usually like to do an apple and cinnamon recipe. This one is pretty similar with more delicious ingredients. Definitely on my list to make. Thank you for sharing.